P2P lending marketplace Zopa announed the plan to roll out the new IF ISA from June 15th to existing customers with target rates of up to 6.1% and also that from December 2017 new lending will not be subject to the Safeguard Fund. Investors in Zopa Core will lend in the same risk markets as Access and Classic (A*-C) but will not be covered by the Safeguard fund. Zopa Core will offer a higher target return of 3.9% after fees and expected credit losses, as compared to 3.7% and 2.9% for Classic and Access. The Classic and Access product offers will no longer be available for new customers, but existing customers can continue to lend through these products until 1st December, when they will be retired. 1. The first stage (from 15th June) will be focused on existing customers who want to open a new IFISA (limit of 20,000 GBP) and lend through Core and Plus. 2. The second stage (1st July 2017 to 31st July 2017) will enable existing customers to sell their current loans and re-purchase similar loans in an IFISA wrapper. This will allow investors to retain Safeguarded loans in the IFISA. Any investing through new lending, or relending as capital is returned, will be onto Plus or Core only. 3. The third stage (from August 2017, but dependent on meeting demand for new IFISAs) will allow existing customers to transfer existing ISA investments with other providers to Zopa. 4. And finally, once we have met demands of existing customers, we will welcome investments from new customers. From December 2017, new lending will not be subject to Safeguard. All loans that currently have this coverage will continue to receive it. Zopa today says it initially introduced Safeguard in 2013 to deal with a tax anomaly that unfairly penalised peer-to-peer lenders. The fund was designed to ensure that investors only paid taxes on the net income they received from Zopa borrowers: and not bad debt. In 2015 the tax laws were updated enabling investors to claim for relief on losses from bad debt. As a result, the primary reason for Safeguard was removed. Last year, based on customer demand, the company introduced Zopa Plus product without Safeguard coverage. Plus has proven popular and since March 2017 Zopa have been operating a waiting list for new investors due to the very high levels of demand. Zopa says that retiring Safeguard will allow the platform to provide greater target returns than Access or Classic (2.9% and 3.7% respectively, versus 3.9% in Core and 6.1% in Plus). Today Zopa launched a new design for the website and introduced a new logo, which I find very simplistic. This fresh new identity will give us a springboard for our ambitious plans to bring our products to even more UK consumers, and create radically personalised services that will help people fully realise their financial potential. While a lot has changed – a bold new logo, icons, and tone of voice – our products still work in exactly the same way. We started on this journey 12 months ago. In partnership with, KBS Albion, we took stock of who we were and where we wanted to be. We wanted to capture and build on our customer-focussed culture: ensuring that our borrowers’ and investors’ interests remain at the heart of what we do. Our new look and tone of voice have grown out of, and continue to reflect, these values; underscoring our commitment to being open and honest in how we look and sound. Very first opinions voiced by investors on the new design are mixed. P2P lending marketplace Zopa, the first p2p lending platform, established in 2005, announced today that it will launch a bank in 2018, offering FSCS protected saving deposits. This will not replace the p2p lending product, which will continue to operate. I wanted to write to you, on behalf of everyone at Zopa, to share some important news. We launched Zopa in 2005 to create a richer life for everyone by making money simple and fair. Since then, we have lent over 1.8 billion GBP, inspired a 100 billion GBP global industry and helped our lenders earn over 75M GBP of interest. We have built a profitable, scalable and viable business. Yet we’ve only just begun. We want to offer consumers even more choice, which is why, subject to regulatory approval, we are planning to launch a next generation bank to complement our existing peer-to-peer products. We will continue to offer our peer-to-peer investment products. Launching a bank, to sit alongside our existing peer-to-peer business, will allow us to create new and innovative savings and borrowing products. At launch, Zopa will offer FSCS protected deposit accounts to savers and overdraft alternatives to borrowers. As an existing Zopa customer, we will give you the first opportunity to try out our new products. We will also actively welcome your input as we shape them. The application process should take about 15-24 months, and we will keep you updated when we have news to share. We believe we are uniquely placed to re-define what you should be able to expect from personal finance products in the 21st century. Over the last 11 years, we have built an innovative, profitable and well-managed business. We have proven that we can deliver great value to borrowers and investors whilst prudently managing credit risk. We know how to originate quality loans seamlessly online and meet our risk expectations. No new bank has that track record, and no incumbent bank has the digital expertise that we do. We put our customers at the heart of all our decisions and obsess over how we can use technology to offer you simple, smart choices. We are looking forward to offering more products to even more people in the UK. 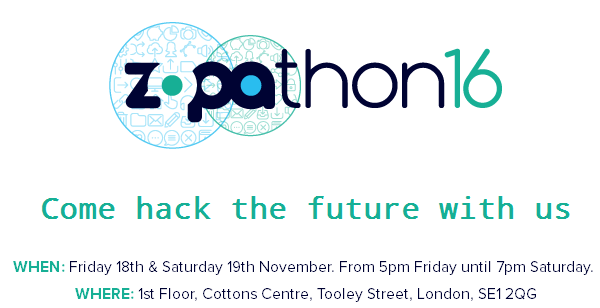 Zopa is the first p2p lending marketplace to run a hackathon called Zopathon. Participants a challenged to code something ‘that makes interest rates more interesting’. I have seen several hackathons in the fintech space but usually they are organized by banks, service providers or accelerators and none were p2p lending specific. Zopa says they will introduce APIs, that can be used in the 24 hour event. Sign up for participants is here. UK app Pariti has integrated loan offers by p2p lending marketplace Zopa into its app allowing users to check whether they could get a better rate for their debt. User can apply for a debt consolidation loan directly from the app. Pariti is using Zopa’s API to access data for the offers. The Pariti app, which claims 70,000 users, connects to a user’s existing bank accounts, analyses their spending history, and helps them set a target for improvement. The Zopa integration enables Pariti users to discover if they could be paying less for their debt without affecting their credit score, and to apply directly for a consolidation loan through the Pariti app. “UK consumers are getting ripped off by credit card companies”, Pariti founder Matt Ford comments. “Introductory offers, confusing fees, and unsuitable products have meant that people are paying far too much to borrow, and are getting stuck in high-cost debt. The product integration with Zopa allows us to proactively help reduce their cost of borrowing and pay off debt faster.”. P2P lending platform Zopa will finance loans for customers of newly launched online mobiler retailer Unshackled. Customers can fund the purchase of handsets by taking out a finance deal with Zopa. The APRs on launch will range from 9.7 per cent to 24.9 per cent. Customers will also be able to pay off early at no extra cost or make additional payments. The partnership is Zopa’s first online retail agreement, with its service integrated in to Unshackled.com sales platform using the Zopa API. 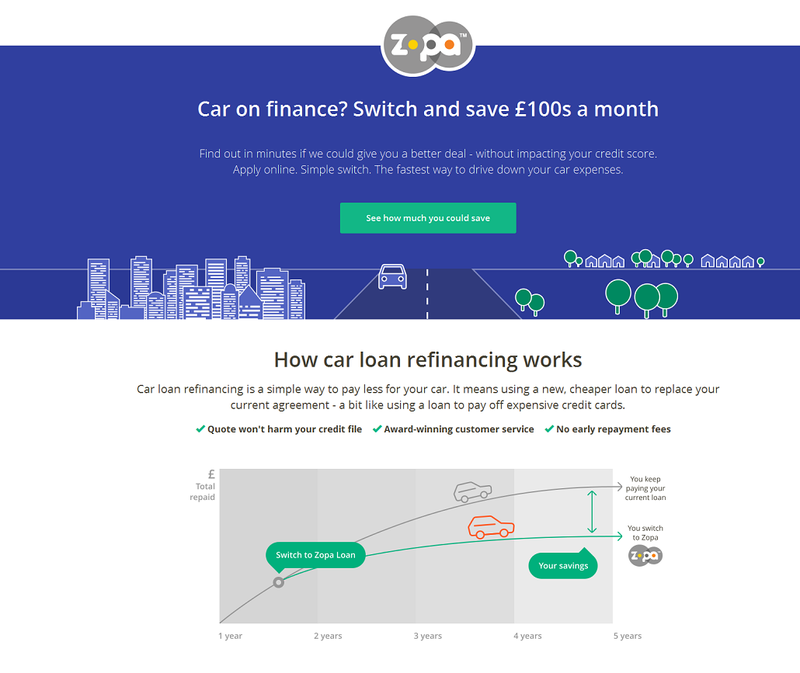 Today UK p2p lending service Zopa announced it will extend its product range to offer ‘Zopa Car ReFi‘, a refinancing product for car loans. It is positioned to allow consumers to refinance existing car loans at a better rate. Zopa’s credit risk algorithms, combined with in-depth vehicle information, act together to provide customers with a free and instant personalised savings estimate, prior to those customers taking out the product. Ownership of the vehicle remains with Zopa’s Lenders until the final payment, when it will be transferred to the borrower. There have been some indicators in the past weeks that Zopa is working to restructure the offered product and to re-introduce a non Safeguard offer to investors. But it was only todays the Zopa announced the details. Today, we are very excited to announce the next generation of Zopa lending products! Over the past months we’ve been listening to our lenders about what they want from their lending products, and what matters most when it comes to lending through our platform. You’ve told us ease of access and the ability to take on more risk are key to offering a broader, more appealing product set. Based on your feedback, we’ll soon offer more choice and providing benefits from recent regulatory changes, particularly around the tax status of peer-to-peer interest. In mid March, we’ll be replacing our existing lender products with three new ones: Zopa Classic, Zopa Access, and Zopa Plus. Together, these products will offer much more choice and flexibility to both existing and new Zopa lenders. As with all peer-to-peer lending, your investments are not covered by the Financial Services Compensation Scheme (FSCS), so your capital is at risk. If you wish to access your money by selling your loans, this is dependent on other lenders being available to purchase those loans. We are sharing indicative rates today, and exact rates will be announced on 1st March. As with our existing rates, the new product rates will vary with the market, so if borrower interest rates go up, the rates on your new loans will go up too and vice-versa. Zopa Classic will give customers the security of Safeguard and access to their money at any time, subject to a 1% fee. This product is most similar to what our lenders have today, however what’s new is that it combines 1-5 year loan terms. For customers who value easy access to their money, we’ve created Zopa Access, which has Safeguard but which has no access fee and a slightly lower expected return. For customers who are willing to accept more risk for higher returns, we’ve created Zopa Plus. Over the last year we have been testing the performance of D and E rated borrowers with our institutional lenders, and based on these tests, we would like to offer loans with D and E rated customers to all lenders. With the introduction of Zopa Plus, customers can lend across A*-E risk markets. Loans in Zopa Plus are not Safeguarded, and so it will suit customers who don’t require this additional security as they are comfortable lending their money via Zopa’s diversification model. Predicted rates of return will be higher but will come with some additional risk. When the new products launch, what will happen to customers’ loans that are in the short and long products? If you’re a current Zopa lender, then as we retire the existing short and long products, your repayments will cycle into the new Zopa Classic product. So the rates will stay the same on your existing loans, but as they get repaid, the repayments will be used to buy new loans within the Zopa Classic product. How will customers be able to have multiple products? How can they be funded? Customers will be able to have multiple lending products with us – you can have an Access, Classic and Plus product – however only one can be selected for new funds at any given time. If you are an existing customer and you wish to move your existing loans from Zopa Classic into one of the other new products, you can choose to turn off re-lending and allow repayments to collect within the holding account and then allocate those funds to a new product. Alternatively, you may sell your loans and purchase new ones within a new product. According to the FAQ, all of the new lender products will be available for the IF-ISA. Queue Up for P2P Lending! When was the last time you stood in a long line outside your bank branch, patiently waiting to deposit money into your savings account? Imagining a scene like that seems ridiculous at a time with near-zero interest rates in an increasingly large number of developed countries. But there where you would least expect it, in the Fintech world of fast-moving bits, some startups actually are imposing measures to throttle influx of investor money in order to balance it with borrower demand. Welcome to p2p lending (short for peer-to-peer lending). The sector is experiencing tremendous growth rates. With attractive yields for investors some platforms struggle to acquire new borrowers fast enough for loan demand to match the ever-rising available investor demand. One challenging factor is deeply ingrained in the business model of p2p lending marketplaces: once a new investor is onboarded and found the product satisfactory, he is most likely to stay a customer for years to come and reinvest repayments received and maybe the interest also. On the other hand the majority of borrowers are one-time customers. They take out a loan typically just once. While it may take years for the borrower to repay that loan, in most instances there is no repeat business for the marketplaces. So the marketplaces have to constantly fire on all marketing cylinders to win new borrowers in order to keep up and grow loan origination volume. This has sparked some outside of the box thinking, e.g. the partnership of Ratesetter with CommuterClub to win their loan volume, which is in fact mostly repeat business. Winning investors has been relatively easy for many of the p2p lending services in the recent past. Investors are attracted typically through press articles or word of mouth. One UK CEO told me he never spent a marketing penny ever to acquire investors. But what happens on the marketplace, when there are so many investors waiting to invest their money in loans, but loans are in short supply? If the marketplace does nothing or little to steer it, then those investors that react the fastest, when new loans are available, will be able to bid and invest their money. This is the situation e.g. on Prosper, Lending Club and Saving Stream. The marketplace has some kind of queuing mechanism. This is typically coupled with an auto-bid functionality. Examples of this are Zopa, Ratesetter and Bondora. The investors are competing during an auction period by underbidding each other through lower interest rates. Examples of p2p lending services with this model are Funding Circle, Rebuilding Society and Investly. The marketplace can lower overall interest rates to attract more borrowers while the resulting lower yields slow investor money influx. The UK p2p lending sector is eagerly awaiting the sector to become eligible for the new ISA wrapper. Inclusion into the popular tax-efficient wrapper will attract an avalanche of new investor money to the platforms. So there is some speculation that UK p2p lending services could impose temporary limits on new investments. The aim of the investor is to lend the deposited money easy and speedy into those loans that match his selected criteria/risk appetite. Idle cash earns no interest and will impact yields achieved (aka cash drag). For the retail investor none of the above mentioned mechanisms are ideal. The “fastest bidder wins” scenario means he would either have to sit in front of the computer most of the time or be lucky to be logged in just as new loans arrive. The queuing mechanisms are disliked as they can prove to be very slow in lending out the funds and can be perceived as nontransparent (see the lengthy and numerous forum discussions on the Zopa queuing mechanism). Underbidding in auctions does provide the chance to lend fast, but at the risk of setting the interest rate too low and this requires a strategy and can also be time consuming. This is part II of a guest post by British investor ‘GSV3Miac’. Read part I first. Most of my concerns about P2P lending revolve around its relative immaturity. Even ZOPA, the oldest in the UK, has only been around 10 year or so, and have changed ‘just about everything’ at least twice. Funding Circle (“FC”)have 3-4 years history, but there have been no two years where the business has actually been stable (maximum loan sizes, loan terms, Institutional participation, etc. have all changed pretty much continually over the period I’ve been investing). How well the companies, and their borrowers, would survive a real recession, can only be guessed at. What do I actually invest in? Well practically anything if the rate looks good. My ‘core holding’ is in RS, but there is nearly as much spread across the P2B platforms. For extra P2P related risk (and maybe reward) I also signed up to invest in the Assetz and Commuter Club capital raises (via SEEDRS). With EIS investments some of the money at risk is renated tax, which you had a 100% certainty of losing to the government anyway. I do not plan to hold most of my investments (particularly in FC) for the full 5 years. After a few months the financial data is well out of date (much of it is already out of date when the loan is approved!) and unless you want to spend time checking how the company is doing, it is easier to sell the loans on and start anew. Similarly if rates start to move dramatically, it’s time to ‘flip’ or ‘churn’ .. selling a 7% loan part when rates move to 9% is possible, but might sting a bit. Selling a 7% loan part when rates have moved to 14% is going to hurt a lot, or might be completely impossible. If rates move the other way, selling a 7% loan part when average rates are 6% is not only easy, it may be profitable (assuming the platform allows marking up). You might wind up with un-invested funds, but as someone succinctly put it on the P2P forum, ‘un-invested is a lot less painful than lost’. The future looks equally interesting .. we are promised P2P investments within an ISA (do NOT hold your breath, this seems to be moving at a glacial pace so far), which could result in a ‘wall of money’ arriving on the scene. We are promised P2P losses to be tax deductible (against income, rather than capital gains), which has an impact on the worth of a protection fund. We will inevitably see some new entrants appear as the P2P area grows and become more attractive (Hargreaves Lansdown, a very large fund management player, has already indicated they might get involved, I believe). We will equally inevitably see some more of the current players merge or vanish, and many of the loans default.